There are a few elements to the card that I want to point out. When I create my cards, I like to use different tools to "dress" up the card a little. I embossed the scrapbook paper background with the Cuttlebug folder to give the paper a bit of texture. I then took a sponge and inked it and dabbed the embossed parts to allow the embossed areas to stand out a bit. Otherwise, the embossed areas get sort of lost into the scrapbook pattern and you can't see it. To create a 3D effect on the flower, I rubber stamped the image twice and colored in one of them and cut out the flower and the leaves. I then remounted them on to the other stamped image using foam tape to give them a 3D effect. I then outlined the flower using Sakura "Souffle" 3D Opaque pen. You can't really tell by the picture but the flowers and leaves are raised up and very 3D. 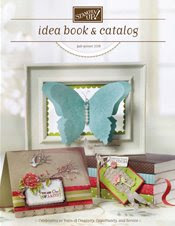 Punches such as circle, oval, and label punches are great additions to embellish a card. 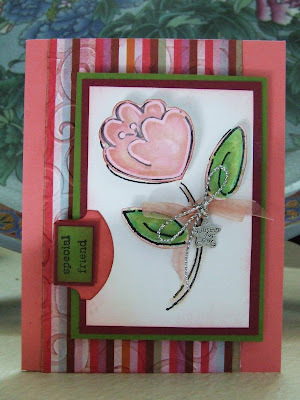 In this case I used Stampin' Up Round Tab Punch. I know doing these little things are time consuming but I think the end results are worth it. Unfortunately, many people don't have the time to sit and make more complex cards. I'm lucky that I do. . .
Click Here for the product reveiw on the Sakura Souffle 3D Opaque pen that I did a few days ago. I'm beginning to really love this pen. I love this card! It's true that all the extra detail you've added has made it an over-the-top exceptional card! WOW!